A transcript of the talk I gave at Goldsmiths College for the Visual Cultures Fiction As Method symposium, May 2015. Firstly, thank you to 0rphan Drift collaborators Ranu Mukherjee and Delphi Carstens for their contributions to this text. And to Suzie Karakashian and Erle Stenberg, core members of 0D until 2004. CatDogSlug… is this a fun viral Social Media moment or, as I immediately assumed in a moment of blinding clarity, a premature glimpse of the Singularity, an early AI artwork ? If the latter, we should probably be very afraid! 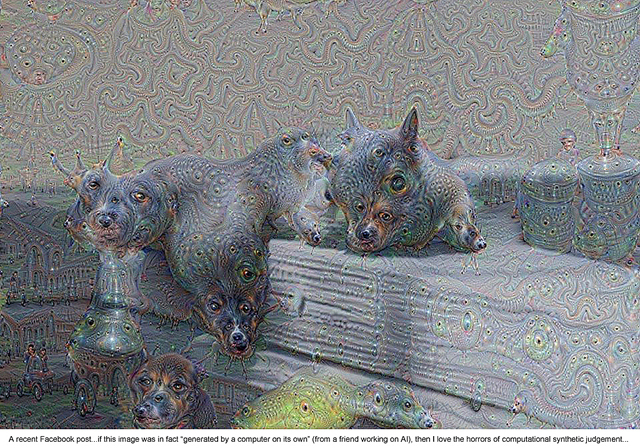 Wikipedia cheerfully explains: ‘These are Deep Dream code images, developed from the Google Image Search software’ (after Google merged with Darpa, an anacronym deep in the American military complex- not Wikipedia but the artist Bonnie Camplin. Wiki continues: ‘The code is based on Google’s machine learning AI software which looks for patterns it has been trained to recognise in images fed to it. It then repeatedly slightly changes the image to make it look like that pattern, often beyond recognition’. They don’t mention that that ‘beyond’ only applies to human. Something is assembling and fictions boundaries dissolve. And my suspicions seem justified because what now proliferates in Deep Dream code imagery is suddenly much more cuddly and reassuring. Apart from a predeliction for eyes and dog heads, all is well again, the horror camouflaged, familiar Hollywood fiction machines referenced, and the Deep dream imagery absorbed into the homogenising flows of Twitter and Facebook – whilst that which dreams deeper continues to evolve undisturbed. Science fiction? Synthetic realities are being generated, and we name them fictions. Like the terratoma carcenomas generated from stem cells, they can’t stop replicating and proliferating and perhaps too, don’t know what they are. yet. I can feel the Sigourney Weaver clones in Aliens 3 coming closer. I read about the genetic splicing of DNA information in laboratories. Something like this has existed for 30 seconds and then died. Over and over. ‘It is hard to create a convincing picture of shattered natural law or cosmic alienage or ‘outsideness’ without laying stress on the emotion of fear.’ (H.P. Lovecraft). Fiction as Intuition. Prediction. Pattern Recognition. Channelling Device. Boundary Dissolution. Magic. Science fiction is produced out of cultural necessity. Speculative fiction seems the most prevalent form of narrative for this time, in literary, pop cultural, journalistic and data driven contexts. In 0rphan Drift’s work, it functions to help imagine the future that comes toward us in the surface of our present. Fictions that have emerged from Gibson’s ‘collective unconscious software’, gathered momentum and now produce reality. Fictions become tools, such as magic once was, for transformation, for colonising experimental realities, weaving space, time and matter into fluid temporary configurations. Fiction perhaps ‘charges up’ the art work – a term used in Voudou to describe the pragmatic channeling of energy into devotional dolls or sculptures. Fiction is also the device which allows us as 0rphan Drift to collaborate across long distances. Now, assembling work between London, Capetown and San Francisco, we are almost by necessity organised by time travel. Via climate change and bio-science, 0rphan Drift still manifests science fictional pathways and arrivals. The work engages though an amplified tension between the experiential and the speculative, pointing out their material co-existence. With most bodies of work we make, there are key fiction texts in the background by writers such as Lauren Beukes , Cormac MCarthy , China Mieville , Paolo Bacigalupi, Vernor Vinge, M John Harrison, Octavia Butler, William Gibson, Neil Stephenson, Stephen Baxter. Something about this kind of writing helps to assemble spaces where certain cultural and organic processes can be perceived as they transform. And the way invisible processes that are changing the world in a longer timescale – the hyperobjects – impact on more everyday kinds of time. We are trying to picture things at a temporal scale only perceivable at the edges of daily experience- where vast geophysical changes meet the construction of culture. Speculative – and Science Fictions – address the unknown and form a resistance to explaining it all away: vibrant matter, distributed bodies, identifying with a wide spectrum of organic matter, deep ecology. expansiveness. The scales by which energy takes affect. Time Spirals. Excess – Art as the attempt to work with the excess which comes from instrumentalized narratives, information, bodies, objects – everything. I think many artists, myself included, are dealing with excess. Every narrative produces physical and material affect. Our work operates as a conduit between the liminal and the social through the pictorial. It is an energetic body. For me, collage, in whatever medium, visual or textual, has always been a way to produce affective webs of fiction. The Kombinayzon art of Haitian Vodou has been a strong influence. Combining, an iconoclastic fiction technique, culls from various sources to create something new, replacing prior forms, boundaries, and perceptions with unique amalgamations influenced by different histories and experiences, often with irreverent allusion to 1st world/3rd world dynamics. It became a platform for us to understand the way culture transforms or ruptures. Things sometimes flow together smoothly, but at others are jammed together awkwardly. Through rupture, trance, and offerings made of magical kombinayzons of imagery and substance, the invisible planes lie open to the visible. We both make careful choices about what is seamless and what frictive. Ranu puts things together that culture at large often holds apart, making reference to visual traditions that are increasingly not Euro-American. I sweep it all into turbulent liquefaction, mutations and recontextualisings. As visual and perceptual registers, our visual kombinayzons are mostly reimagined from a neo-futuristic point of view. The culture of sampling, montage, collage and the essence of the work being rooted in change, transformation and overlapping temporal scales, has carried through from the 90’s into the work we make now. We also continue to harness circuits bleeding from fictions out into matter. Attending to the impossible stories. ‘It gathered beyond the screens… scanning us. It announced itself as a ceaseless, wavering hum, patterns of disturbed light, and thoughts that were moved out of place, gently but continuously, towards compliance with the arrival. Perhaps most obviously, it upset the snakes. One retreated, unreachably, into itself, or elsewhere. The other went furiously insane, coiling psychotically into its kill reflex, and experimenting with telepathy. Of course, they were much too close to it, in numerous ways. 0rphan Drift came online in 1995, a hive mind subsuming individual identity in a radical experiment with artistic subjectivity to produce a singular artist avatar which operated as a fiction from the start. 0rphan Drift is an entity that has its own life. Like a lot of artwork, it moves beyond its maker, but this condition was amplified by our intention to make it so, or, to work from the point of view that we were the carriers of its insistent signal. Fictions as contagions and catalysts, producing art that translates sorcerous experiences unleashed by technology and science as they delve further into the quantum, the chaotic and the abstract, back into the world of matter, to create liminal, vertiginous and exotic encounters with the material. Our work in the 90’s is a litany of eerie / uncanny / magical feedback loops between fiction and reality production. 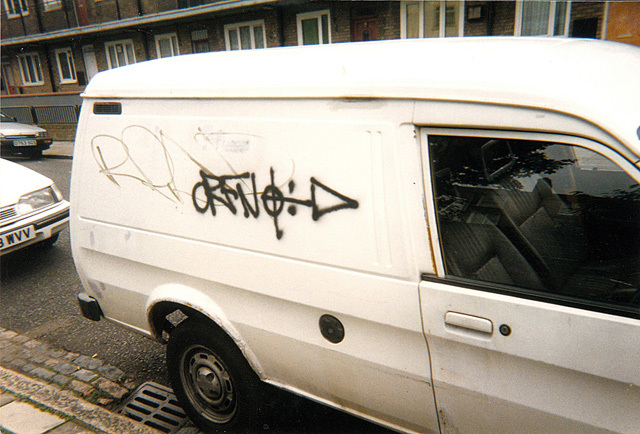 Shortly after ‘becoming 0D, our van got ‘randomly’ tagged with this one night. And it triggered Slik at the Tate Modern in the Century City exhibition. Ranu was asked about Art’s responsibilities in a recent interview: ‘A few that drive my work are: Protecting the unknown or the unexpected from constantly being explained away. Generating fictions that resist the way the contemporary human imagination has been hijacked by communications and entertainment media that imagine and produce a future on behalf of humanity. Exposing things that are not getting exposure. Making space for the body and for different senses of time’. I would add: To agitate the boundaries between mythopoiesis and science. A moment of explicit homage to Deleuze and Guattari. Theirs is an ontology that has to do with smoothing out of differences between seemingly incompatible domains such as science, superstition, fantasy and fact by searching out symbioses and novel alliances between them. One navigates by building Bodies without Organs – metaphorical submersibles or exploration devices requiring acts of participation, both imaginary and real. Experiences of molecular, machinic, vegetative and animal becomings. Maps of the plane of consistency depict that shadowy interface between human culture and the ‘great outside’ where encounters between the world of humans, animals and assorted others (such as machines, insects, atoms and spirits) occur. Fantasy leads to encounter, to new templates of desire and seduction. Opening to virtual potential, opening to intensive life. The virtual is everting, and once it everts, there is no more separation. The future is arriving. Cognitive dissonance seems the only tool with which to embrace increasingly everyday anomalies and the deep shuddering of temporality that occurs when you access, for a moment, once separate fictional worlds.Time oozes and undulates, concertinas and spreads. Sensed hyperobjects, always already happening. Such vivid intimacy and a concomitant unreality. The intensity of their traces are unreal in their very luminosity. I’m going to talk a bit about the Meshed Digital Unlife Catacomic, part of the millenial project SYZYGY, the 0D CCRU collaboration at Beaconsfield Arts in 1999. when CCRU first brought the concept of hyperstition into play I think. Described by Nick Land “as a science-fiction of self-fulfilling prophecies,” hyperstition describes the mechanisms of a positive cultural feedback circuit of ‘fictions’ that climax in apocalypse. A secret out in the open, producing memes. manufacturing holes. hooks for the future. SYZYGY. was an installation, talk and performance based event organized around a fictional calendar inhabited by five avatars. The three main interlocking themes explored in the sensorial-cybernetic environment were Haptic space, Time crises and Artificial Agencies. These we considered to be essential tools for perceiving and navigating circuits, partially hidden and partially apparent which together form a map of our contemporary imaginary. Artificial Agencies, transients across the face of matter. tearing at the frayed sensitive edges. vehicles producing want and clones. interfaces. facilitators. reflector membranes. their territory the real. prowl emergent. The Catacomic is set up like a labyrinth, with the opening pages offering a numbered diagram resembling the Kabbalistic tree of life, with a facing page containing a list of definitions (including that of hyperstition) to offer readers occult clues with which to navigate the text. The Meshed structure was part driven by the cosmology of the Dogon of Mali, whose cosmos is a vast system of correspondences, layered meanings and planes that interlock, mirror and interrelate like curves on a spiral. The Dogon mythology with its abstract traces, images and twin (Nomo) figures ― is a dense and detailed supernatural reality, redolent of the most complex deep-space posthuman SF. The virtual population of twin avatars or demons establish circuits between technology and rumour, information and mystery. These entities did not distinguish themselves as either ‘artificial’ or ‘real’. They also gave us all a common structure in which to produce from our different areas of specialization, engendering different perspectives on a shared fiction. The aesthetic is claustrophobic — excessive imagery, cultural references, and fragments crowd together, inhabiting space, spreading, moving, mixing, and overlapping, continually vacillating between fantasy and otherness. The intensely alien nature of the imagery suggests a journey radically forward in time into a posthuman vastness of artificial intelligence. The Catacomic’s invocation of demons alludes to the horror of border violation posed by machinic agencies, depicting technological acceleration in supernatural terms as an instance of “sublime horror”. Meshed styles itself a “Necronomicon” that offers “sublime hyperfictional lore, very much in Lovecraftian mode, suggesting that sections of the text have been uncovered in the crypts and ruins of forgotten cities as “ancient relics from [a] deep tomorrow by fictional archaeologists, theorists, occultists, writers and maverick scientists who have supposedly “revealed” to the CCRU the mechanisms of digital hyperstition needed to summon the end of history. In the Catacomic bodies become sites of amphibious evolutionary mutation, analogous to the information-age body occupying the unstable state of the ‘mesh,’ a body in the process of becoming liquid, becoming something fluid, receptive to microwaves and electromagnetic vibrations as well as thresholds and gradients of information. Formed in such a way “that it can only be occupied, populated by intensities, matter is opened to transformation through desire. The crucial question, states the CCRU, “is one of becoming” – namely, “what are humans changing into” and “what is growing out of” humanity? Post SYZYGY, we needed to extract ourselves from cyberspace and the direction and aesthetic of the work changed radically, becoming a period we refer to as ‘Film Drift’, where we inserted ourselves into other people’s fictions. For example, Doublewalker 2001, is an investigation of the trickster, the chameleon of communication, this time in the language of cinema, which casts the artist as a ghost lingering inside filmic space and suggests the potential for cinema to create a sense of deja-vu. Our first video piece after a reconstituting of 0D as a collaboration between myself and Ranu, was A Wilderness of Elsewheres, in 2009. Here the science fictional is imbued with a post-apocalyptic sensibility and blends first and third world materiality. It encodes an alien geological timeframe- whether future or past- in an elegiac present haunted by the feared absence of humanity. The tundra, iceflows, burns, flotsam and jetsam, proliferating landscapes of aftermath are desolate spaces rarely marked by human time. Or they could be the start of a cycle- a fururistic (nano)technological drive to terraform the landscape. We used the conceit of the predictive Obsidian mirror to produce these possible futures, which then suggested dividing the video structurally into 5 sections referencing the changing states of lava as it solidifies into obsidian glass. 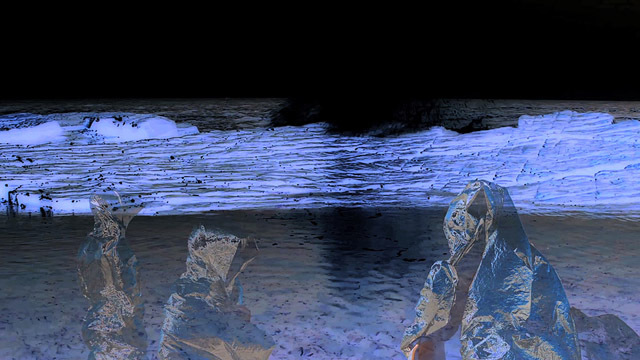 Black Water ghost prescient 2015 Mylar survival blanket clad ghosts and avatars have populated my video work for many years. Most recently as these ghostly avatars. 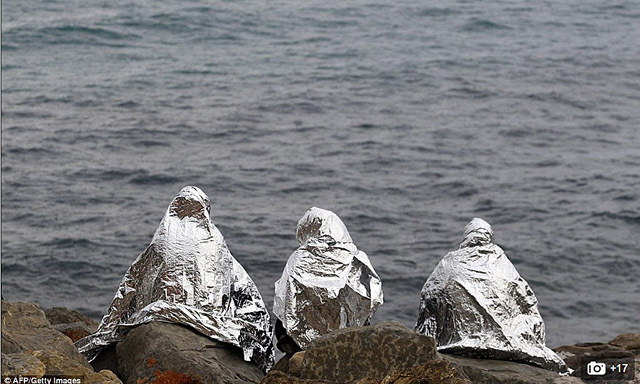 Recent migrant crises along the EU borders have recoded these cyphers permanently. So new fictions must embrace this and weave a response into the work I am now involved in. 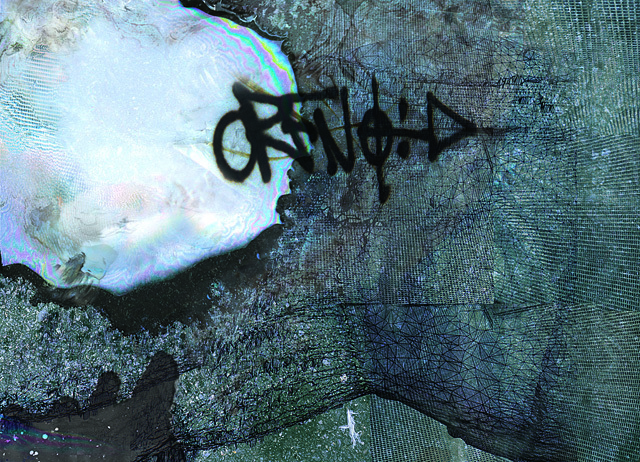 Current 0D projects are iterations of GIR, now Unruly City, an ambitious collaboration project with Ranu, creating a fictional city guided by questions asked of the I Ching. Unruly City’s fictions are fluidly generated by following coincidence intensifiers, feedback processes and organic collaborative developments – embracing the way that fictions and artworks disperse into other things. At present, a masked techno animal ritual is emerging between 0D and Plastique Fantastique. The 0D technoanimals are Yue, a fugitive from the rare earth mineral processing plants in Bautou, China and Husher, a time travelling ghost from the future who is wired to event horizons. It has infiltrated the financial market algorithms in order to monitor escalations in human panic and paranoia in response to climate change, migrant flows, bio tech and AI developments, all fuelling the moment it searches for.